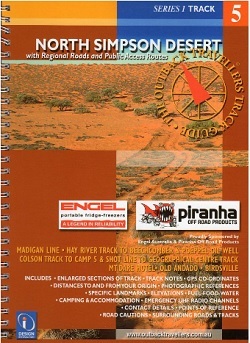 The North Simpson Desert, in this Map Guide, is primarily concerned with Dr. Cecil Madigan's track across the Simpson Desert from Old Andado to Birdsville. The Campsites of his expedition in 1939 are indicated with (Black dots) and numbered accordingly. This area is not for the faint hearted, it demands expertise in 4wd handling, recovery knowledge and experience in dealing with extremely remote conditions. Travellers should be very well prepared and self sufficient for any emergency. It is advisable to travel in a party of two or more vehicles. Some of the area crosses Aboriginal Land and permits should be applied for if travelling this direction. Camp 24 was not visited due to the particularly difficult means of getting there by 4x4. This track covers some beautiful yet rugged terrain, hard on vehicles and people combined. The ultimate 4wd experience through some of Australia?s most pristine red desert country. The Sectioned Maps will help you find everything of interest along the Track and point out potential road cautions in advance, supported by visual references, for the benefit of your safety. Simpson Desert is sectioned into 8 parts (Section A-H). All Regional Roads and Public Access Routes. All Tracks fully mapped with Garmin GPS 76CS. Datum WGS 84. Photographic references to associate with specific locations. Colour coded track information indicating dips, crests, creek crossings, floodways, sharp bends, grids, gates, bogs, homestead tracks, historic sites. Geographic locations, towns and services.